With Route 12 blocked, you must take the roundabout route to Lavender Town. Diglett's Cave connects Route 11 with Route 2, emerging near Viridian Forest. Head north to Pewter City, then east to Cerulean City and Route 9. Now that you can use Cut, be sure to visit the secret lab behind the Pewter City museum. Diglett's Cave connects the west side of Route 11 and the northern end of Route 2, near Viridian Forest. The path is simple, but the abundant Diglett and Dugtrio can be annoying, so remember: Flying-types are immune to Ground-type attacks. With Digletts between levels 15 and 22 and Dugtrio between 29 and 31, this is a truly amazing place to level up Pokémon, especially Flying-, Water-, and Grass-types such as the level 10 Squirtle you got from Vermilion City in Yellow where it can catch up with the rest of the game's level expectations quickly here. Pokémon in the Pidgey, Spearow and Zubat families can level up fast, as well as Farfetch'd, Gyarados and Butterfree. Beware of the Dugtrios, however, as their 120 base speed will allow them to usually go first (since where you're possibly at right now, they're usually slightly higher in levels, thus they definitely go first), usually with Dig, and it can hit very hard with STAB power especially along with a high critical hit rate. Beedrill, by the way, is not a Flying Pokémon. They are Bug and Poison, so they are still vulnerable to Ground attacks. 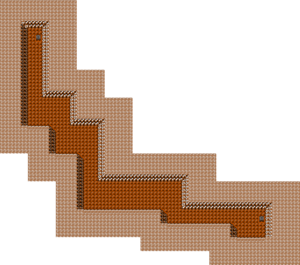 When you exit Diglett's Cave, you'll be in a familiar place, the north end of Route 2 near the exit of Viridian Forest. Now that you have Cut, the remainder of Route #2 is available to you and can collect items that you weren't able to get without it. The building south of the cave exit has a guy who is willing to trade you a rare Mr. Mime in exchange for an Abra in Red/Blue, or a Clefairy in Yellow. Further south, there's another building in which you can get HM05, which contains Flash, the item you came for. This is used primarily to light caves, but in battle it will lower the Accuracy of your opponents' attacks by one stage. Its current owner, another one of Professor Oak's aides, will only fork it over if you have 10 or more Pokémon. Below that house are two item balls which contain an HP Up, and a rare Moon Stone. While you're in the area, head back to Viridian City and cut down the tree in the lower left-corner. Walk inside the area and talk to the man, and he'll give you TM42 with the move Dream Eater, an Psychic-type move that can be used to damage a target when it is asleep to restore some of the user's Health Points. Cut aside another tree in Pewter City to get the Old Amber from the museum curator. When that's all done, either travel through Mt. Moon, or cut back through Diglett's Cave, and head to Cerulean City. If the Cerulean City Pokémon Center was the last place you healed, you can use an Escape Rope or Dig/Teleport (use Escape Rope or Dig inside Diglett's Cave) to quickly get there. Since it's an easy trade if you're able to get the notoriously hard to catch Abra, you should definitely pick up a Mr. Mime. It doesn't have many good moves and it can't evolve, but its Normal-type status move, Substitute, in which it creates a clone that fights for it for 25% of its maximum health is pretty cool for taking weak hits while not really being damaged. As far as attacking combat goes, Mr. Mime is decent but not really to an extent as other Psychic-types; if you're looking for a Psychic-type that does good offensively, you might as well keep the Abra you would trade for Mr. Mime since it will eventually have a better special and speed. But this is a great opportunity to get the sole Mr. Mime in the game, so make the trade anyway to have some of your Pokédex progress added. Just don't feel too underwhelmed when you go to use it in battle. This page was last edited on 10 January 2019, at 03:48. This page has been accessed 914,739 times.